On Wednesday at GAHS, senior Ashton Webb signed her National Letter of Intent to join the Ohio University volleyball team. Sitting in the front row, from left, are Shannon Webb, Ashton Webb and Margi Webb. Standing in the back row are GAHS athletic director Adam Clark and Blue Angels head coach Janice Rosier. CENTENARY, Ohio — A brand-new Bobcat with plenty of attack. 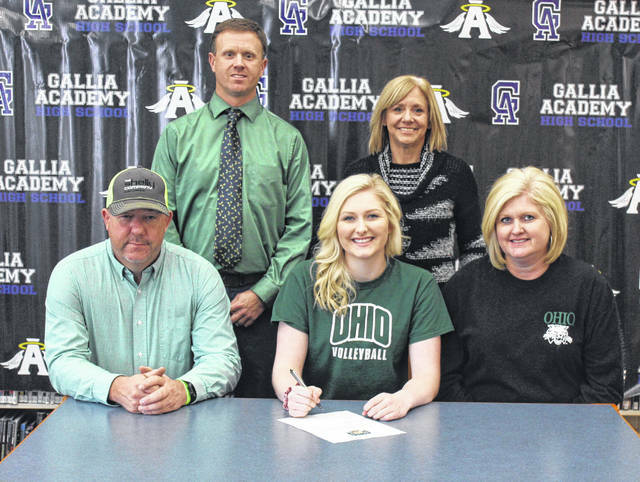 On Wednesday at Gallia Academy High School, senior Ashton Webb — the Blue Angels’ all-time leader in kills — signed her National Letter of Intent to join the Ohio University volleyball team next season. Webb — an outside hitter and defensive specialist on the court — has realized a life-long dream, but acknowledged that she still has plenty of work ahead of her. In four seasons with the Blue Angels, Webb has helped the squad to a 91-9 record, five league titles, and four sectional crowns. 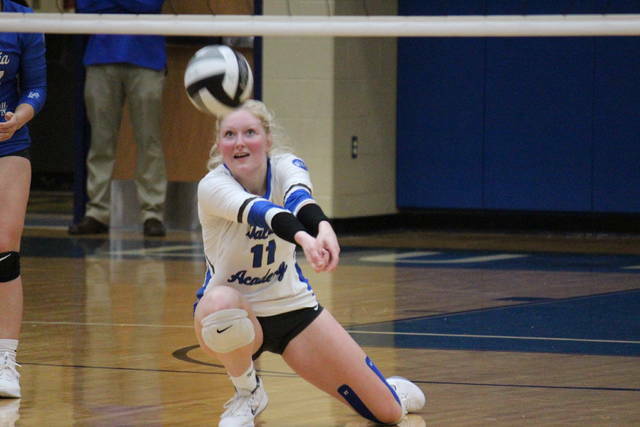 Webb was named to the All-Ohio third team in both her junior and senior seasons, becoming the first Blue Angel to earn multiple all-state volleyball honors. GAHS head volleyball coach Janice Rosier has known for a while just what kind of player she had in Webb. As a senior, Webb had a team-high 369 kills — giving her a career total of 1,086 — along with a 33.4 hitting percentage. Webb’s 75 aces this fall were second on the team and put her six-shy of 300 for her career. She also recorded 10 blocks and 172 digs as a senior. Webb was a three-time All-Ohio Valley Conference first teamer, after being selected as an honorable mention as a freshman. A two-time District 13 player of the year, Webb was a first team selection three times, following an honorable mention nod as a freshman. With everything she’s contributed to her team, Webb is grateful for everything her school has given back to her. Webb’s volleyball success hasn’t only been in high school, as she was an All-American performer at the 2016 USA Volleyball’s Girls Junior National Championships. Webb holds a 3.7 grade-point average and is currently ranked 19th in the GAHS Class of 2019. Ashton plans on majoring in Early Childhood Education, while helping the Bobcats improve on this season’s 13-18 record.